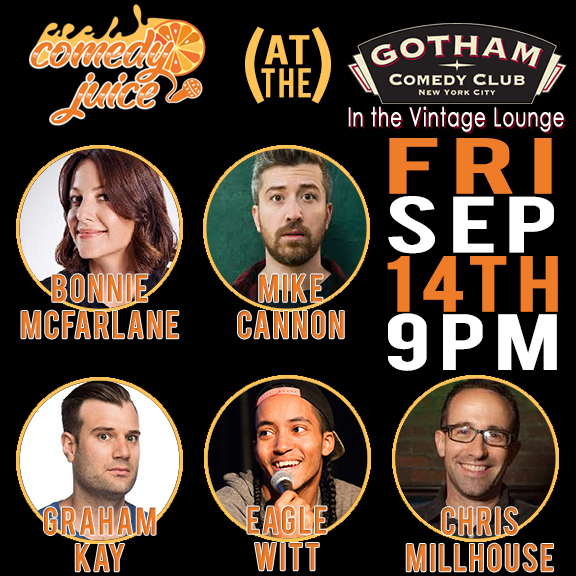 Gotham Comedy Club :: ComedyJuice (The Vintage Lounge) w/ The Tonight Show’s Bonnie McFarlane, Comedy Central’s Mike Cannon, VH1's Chris Millhouse, Colbert's Graham Kay, & Eagle Witt!! ComedyJuice (The Vintage Lounge) w/ The Tonight Show’s Bonnie McFarlane, Comedy Central’s Mike Cannon, VH1's Chris Millhouse, Colbert's Graham Kay, & Eagle Witt! !